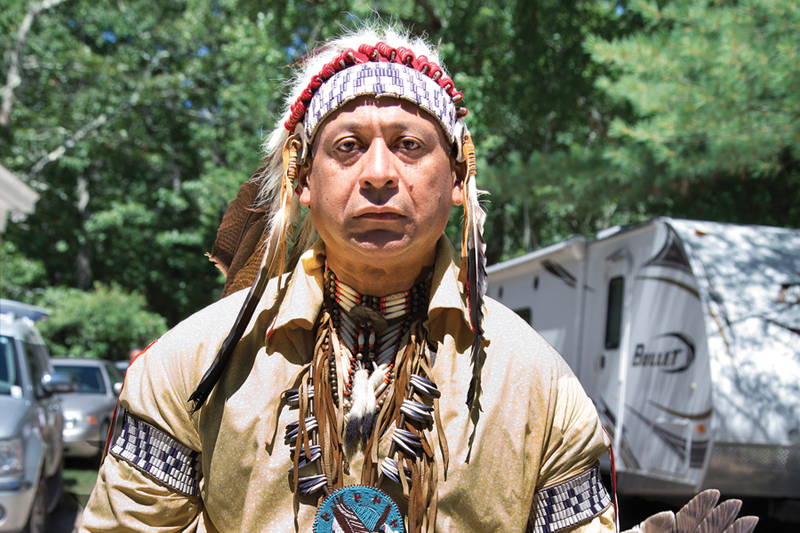 For sixteen straight years, Chief Sachem Matthew Thomas of the Narragansett Indians has fought for his tribe in the public arena — and he’s been roughed up along the way. Is the outspoken leader capable of changing the game? It’s been forty years, but Matthew Thomas still remembers. He was sitting in a classroom in a middle school in a town that bears his tribe’s name. He recalls the color of the walls and the dingy carpet — the only things in the room darker than his own skin — and the words scrawled in squeaking chalk on a blackboard: Bloodthirsty. Savage. Animals. His middle school history teacher was giving a lesson on the Narragansett Indians, molding minds on a subject that was so much more than history to young Thomas. It’s in his fabric and his spirit. The thirteen-year-old didn’t say a word. At the time, Thomas wanted to get the facts straight before opening his mouth and responding in anger — a risky thing for a young minority in the 1970s, especially one who was already familiar with the principal’s office. These days, Thomas can’t keep his mouth shut. The chief sachem of the Narragansett Indian Tribe has abandoned that troubled boy cowering behind a textbook, afraid to go head-to-head with a white man packing chalk. Now he resembles a swanky Philadelphia lawyer and speaks loud and clear on issues related to tribal sovereignty, including the non grata Indian casino and the infamously violent smoke shop raid in the summer of 2003. His unsentimental, outspoken ways have earned him a top spot on Rhode Island’s unwritten list of controversial figures. A fan of Muhammad Ali, the fifty-two-year-old Indian chief compares his tribal role to that of a heavyweight boxer who’s been knocked down and beat up but is still standing, strong in spirit and capable of changing the game. And Thomas will enter the ring with just about anyone to fight for his tribe — regardless of how roughed up he gets in the process. Thomas was elected in October 2012, two-to-one by popular vote, to his fourth consecutive term as chief sachem of the Narragansett Indian Tribe. Sixteen years as chief and more than twenty years in tribal politics have done a number on Thomas’s hairline. “I’ve aged dramatically, I’m losing my hair. I’m going to have to shave my head and have that genie look,” he says, though he doesn’t seem too worried about it. Despite a little gray by the temples, Thomas is stronger and fitter than ever; his two looks, suited up or golf-course casual, give off the air of a white collar professional more than an Indian chief. But chief he is, of roughly 2,400 Narragansett Indians scattered all over the world, most in Rhode Island. As their leader, Thomas has spent time in jail for simple assault. 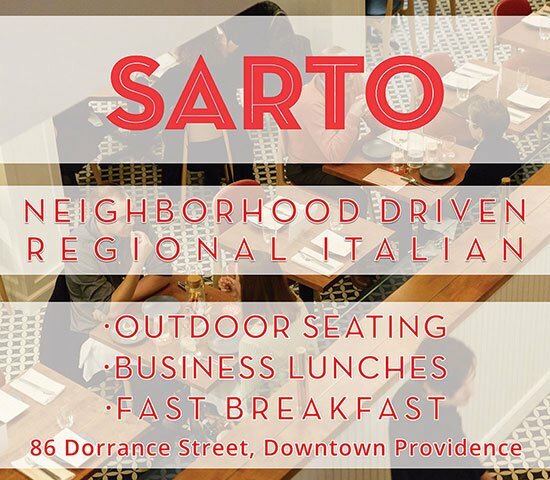 He’s written press releases, he’s met with three consecutive Rhode Island governors and he’s broke bread with Donald Trump (“That was an interesting lunch,” he says). He’s had awkward run-ins with small-town politicians and spends so much time in court he’s starting to identify with Perry Mason. But every moment of every day, Matthew Thomas carries the weight of his tribe’s past on his shoulders. He has royal blood streaming through his six-foot-four frame, and has the presence of the imposing, brawny Indian chief his ancestors embodied. The great Ninigret, a sachem during the 1600s and a friend of Rhode Island founder Roger Williams, is Thomas’s seventh great-grandfather; his second great-grandfather, Ben Thomas, sat on the tribal council — the governing entity that works closely with the chief on tribal issues — in the late 1800s when the Narragansett tribe was stripped of all but three acres of land. His parents separated when he was six. When Thomas was twelve, his father died. “He might have been a strict man, but we loved him dearly,” he says tenderly. As they grew up, Thomas and his older brothers spent more time on the then-three acres of reservation land in Charlestown, the best sort of playground for teenage boys. “One of my brothers took me to visit my family burial grounds and I didn’t even know it was there,” Thomas says. What Thomas remembers most about visiting the reservation is the peace of mind it offered him. “If you’re down there and you’re quiet enough, you can see deer and wild turkey, owls, even hawks,” he says. Thomas identified with the hawk, a majestic, territorial bird. When it was time to choose his tribal name, Thomas and his brothers decided on e nada wushawunun, or Seventh Hawk, an ode to the powerful bird of prey and to his own historical legacy as his father’s seventh son and Ninigret’s seventh great grandson. Name-calling, fights and trips to the principal’s office punctuated Thomas’s high school career, but he remembers several teachers who gave him a chance — and one in particular, Mrs. Pitocchi, who groomed him to succeed. Pitocchi says she saw something in Thomas — something he didn’t see in himself until several years later. “I always told my students that you never know where life will take you, and he was always one of my prime examples of that,” she says. Thomas’s teammates knew he was a member of the Narragansett tribe and called him “Chief,” sometimes to his face and sometimes behind his back. He didn’t like it at first, but eventually Thomas embraced the nickname as a term of endearment. He was elected to the tribal council that year. But the workload plus a full-time job took a toll on Thomas and he didn’t run for reelection in 1996. During that one fateful year when Thomas wasn’t involved in tribal politics, then-United States Senator John Chafee slapped a last-minute rider on a Senate appropriations bill that would force the tribe to seek voter approval for high-stakes gambling on their land. At the time, Rhode Islanders were largely against casino gambling in the state. But the rider passed with the appropriations bill, making it more difficult for the tribe to take advantage of a federal act that allows indigenous people to open casinos on their own land. The rider marked the start of the tribe’s long and fruitless effort to nose into Rhode Island’s gaming industry — an effort Thomas led from the very first day he was elected chief in 1997. And he has, down a long and convoluted road that’s resulted in little economic development, few social resources for the tribe and lots of legal bills. The casino never happened, and tribe members had to sit and watch as table games went live at Twin River Casino in Lincoln last spring. Another economic development project, a 2003 smoke shop on tribal land, was raided by thirty state troopers three days after opening its doors for selling tax-free cigarettes on land subject to state and local laws. The scuffle left tribal members bruised, beaten, jailed and convicted of disorderly conduct and simple assault — Thomas included. And an elderly housing project, which started in 1991 with the purchase of thirty-two acres from a private developer, sits in limbo, built up but vacant as a Midwestern ghost town. All of its prospective tenants died waiting for an affordable place to call home. Thomas speaks with fervor about the casino debate: The biggest issue with me is how they denied us. If we couldn’t have gaming because of legitimate reasons, then fine. But to do what you did to the tribe, that’s the issue with me. Something within him turns cold, stony, even defensive, when he discusses the smoke shop raid: You’re not dealing with the Hell’s Angels; why’d you have so many cops? Do you think we’re complete animals? ’Til the day I die, I won’t feel like they had the right to be there. But the failed elderly and affordable housing project just exhausts him. “People wonder why a lot of our folks are angry,” he says. In 1998, the tribe requested that the Department of Interior (DOI) take thirty-two acres of tribe-owned property into trust for an elderly and affordable housing development project. The elderly homes were already constructed, but faced zoning and watershed problems under town regulation; the affordable homes were in the early stages of construction. The DOI agreed to take the land into trust, but the town of Charlestown and then-Rhode Island Governor Donald Carcieri wouldn’t allow it, fearing the land wouldn’t be used for affordable housing, but instead for an Indian casino. After ten years in and out of several courtrooms, the case climbed up to the United States Supreme Court in 2009. Thomas and some tribal council members watched as the Court upheld the state, which argued that the trust process could not hold for tribes that received federal recognition after 1934. Since the Narragansett tribe was not federally recognized until 1983, the court ruled that the thirty-two acres could not be put into trust. The historic decision also affects the land trust status of hundreds of tribes across the country. Legislation known as a “Carcieri Fix,” which aims to give all federally recognized tribes the opportunity to put land into trust, has floated through the legislature for several sessions but has not yet made it to a vote. Joe Larisa, the former embattled East Providence mayor and Charlestown’s legal adviser for all things Indian, says the town gave the tribe the chance to make the housing project a reality in 2011. The Narragansetts had to agree that the parcel of land would operate under state and local laws, just like the other 1,800 acres gained in 1978. Three years ago, the tribe received nearly $2 million from the federal government to refurbish the already-standing homes; they had to return it after they couldn’t reach an agreement with the town. Without the funds, Thomas says, the tribe will likely have to demolish the standing structures. The drumbeat picks up, fast like a fluttering heart. The clanging of bells and shells, war whoops and low, guttural chanting resound as natives descend upon the powwow circle. It’s the 338th recorded Annual Meeting, or Green Corn Thanksgiving, for the Narragansett tribe, and Thomas’s sixteenth as chief. The razor-sharp August sun cuts through the trees and catches the white beading in Seventh Hawk’s headdress. He leads the Grand Entry, dancing down to the circle and beating his moccasins into the dusty earth: two pulses with the left foot, two pulses with the right. He’s not singing or chanting, but is engaging the crowd, pointing to supporters and flashing broad, toothy grins. Once he hits the ring, however, Thomas’s face turns to a familiar sort of solemn. Narragansett tribal council members, dancers, warriors and elders surround their leader in the pit of the powwow, and natives from neighboring tribes trail behind. At the center of it all, with a large hawk on his back, Thomas stands tall. Burdick still lives in Charlestown — less than one mile from the home she was raised in — with her six-year-old son and husband, Tom. “I need trees, I need quiet, it’s just how we were raised,” Burdick says. When Burdick was young, her family valued play and outdoor activities. But Thomas was strict when it came to schoolwork. “He always said to us: ‘Your only job is to go to school, get good grades and graduate,’” she says. “His form of punishment was writing out of a dictionary or reading a book he already read and making us write a report on it. “It was torture,” she says, laughing. As an adult, Burdick stays out of tribal politics. She offers her services as treasurer on the Parent Education Committee, which organizes activities for tribal children during school vacations, but otherwise stands at the sidelines in a supporting role for her father. Although the smoke shop and casino are off the table for now, Thomas and the tribal council have discussed other sources of economic development, including a new health center on tribal land. Thomas also mentions a large body of water on the reservation that matches the scope of the reservoir in Scituate and would be of value, economically, to the tribe. The council is researching large-scale solar farms, wind turbines and other money-generating green projects as well, which could help sustain the tribe in the future — his grandchildren included. “The world’s changing; we can’t rely on fossil fuel forever,” he says. It’s a sunny late-summer morning on the deck of a Providence coffee shop, and Thomas is already wound up. He sips a decaf coffee with Equal; anything stronger than Dunkin’ gives him the shakes. Wearing a polo and khakis, a wide-brimmed straw hat and aviator sunglasses, Thomas looks like a cop on vacation in South Beach. But the ideas he’s expressing, the passionate, soapbox type, could only come from Seventh Hawk’s mouth. Loren Spears, executive director of the Tomaquag Museum in Exeter, sat with Thomas on the tribal council for four years and sees his role as chief as one that requires a strong sense of duality. She recalls an idiom her grandfather often repeated: You must have one foot in each canoe. Narragansetts, and indigenous people in general, must maintain a connection to their tribe and, at the same time, be an active part of the larger American community. He’s not going to throw in the towel this late in the match. And if anyone can give ’em hell in the ring, it’s Seventh Hawk.